Welcome to Midweek Madness, where the Meghans are Markle and the only winner of the gig economy is reality star-turned-deep stealth sponconista Olivia Culpo. 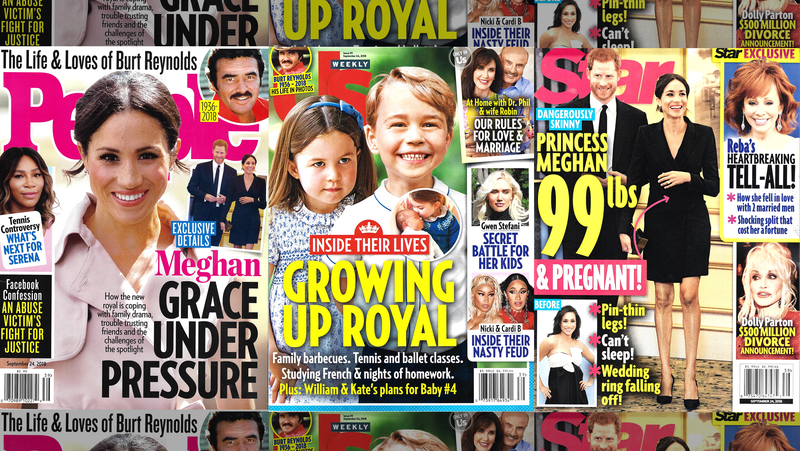 OK, so not to be all “first-year college student realizes how world works” but Meghan Markle’s only on the cover of this week’s People because people buy magazines with Meghan Markle on the cover!!!! I can’t think of any other reason why this deeply who-cares update on Meghan’s life—she’s going on a two-week tour of New Zealand, Australia, Fiji, and Tonga with her husband, Prince Harry and, like… settling into her new life or whatever—would be on the cover other than the fact that People’s editor-in chief, Mrs. People, knew that she’d sell a buncha mags! Same with how People handled Burt Reynolds’ obit vs. Mac Miller’s. Burt’s got a cover insert and a five-page spread, while they only give Mac a half-page single graf. Why? Because People have determined that memorializing Burt Reynolds is more profitable than memorializing Mac Miller! I feel! The editorial/advertising synergy is also super transparent, too. There’s a recipe for Reese Witherspoon’s Corn & Cherry Tomato Salad opposite a full-page ad for Hillshire Farm turkey slices, a Peta Murgatroyd 24-hour food diary opposite a full page ad for Protein One snack bars, a cute but huh? quickie about goat doctor Leanne Lauricella opposite a full-page ad for Blue Basics dog food, a skincare listicle featuring Cate Blanchett and Taraji P. Henson sandwiched between ads for L’Oréal Paris… It’s just all so obvious! Back to the Meghan Covher Storhy: It opens with her and Prince Harry going to see Hamilton, which I think is meant to foreshadow how she’s “not an actress anymore,” according to makeup artist Daniel Martin, but it just kinda underscores how empty Hamilton’s revolutionary era themes are? I mean, isn’t Prince Harry’s ancestor the bad guy? And here he is hundreds of years later still going on tours to check up on former colonies?? Anyway!! Ryan Lochte threw his wife in the ocean, Dakotah Johnson and Chris Martin got matching tattoos, Judy Greer is good, and Matt Lauer’s friends don’t wanna hang out with him. Prince William and Kate Middleton’s kids exist, and I! don’t! care! David and Victoria Beckham are NOT getting divorced, January Jones wore it best, Janel Parrish was more bridal gown train than woman at her wedding last week—not that that’s a bad thing! !—and Shia LaBeouf got coffee. Speaking of NOT getting divorced, Geena Davis is NOT getting divorced from her husband, Reza Jarrahy, because, she claims, they were never married in the first place! Geena Davis rules. The Geena Davis Institute on Gender in Media? The Long Kiss Goodnight, a classic movie about not thinking you’re hot then realizing you’re hot? What a woman! Never wanted to know Dr. Phil and Robin DeGraw’s “Rules for a Happy Marriage”? Great! Us Weekly’s got a four-page interview you never have to read. Deeply here for Katie Holmes’s mid-career pivot to mid-career Isabella Rossellini?? Fuuuuuuuuuuuuuuck, look at this goat. I couldn’t find a new issue of J-14 this week, so the only Jojo you’re getting this week is Jojo the surfing corgi.